Beth Chatto, writing (with Christopher Lloyd) in Dear Friend and Gardener – Letters on Life and Gardening. In April 2012, The Spectator magazine published an article by the gardening critic, Anne Wareham, criticizing the National Gardens Scheme (NGS), which was launched 85 years ago to raise money for a good cause. The birth of the NGS ‘blighted gardens in the UK forever’, Wareham claimed. The charitable purpose of the scheme served to excuse the ‘reality of [the gardens’] predominant mediocrity’. ‘I don’t think you have any concept of how many hundreds of humble, innocent garden-owners and NGS volunteers were deeply hurt by your diatribe…’ George Plumptre, chief executive of the NGS, commented to Wareham. Indeed, the British take great pride in gardening, looking at gardens and talking about flowers and trees and mulch and weeds. Garden visiting is rooted in British heritage. During the Italian Renaissance the upper echelons of European and British society, especially royalty, began visiting each other’s gardens. The British aristocracy delighted in establishing lavish, green creations. During the 18th century appreciating gardens became a sign of good taste; the impeccably refined adopted a philosophical perspective on the relationship between gardens and landscape. This was the era of landscape designers such as Lancelot ‘Capability’ Brown. Landowners contrived and interwove flora, landscape features, ornament and architecture in various configurations (symmetrical, asymmetrical, naturalistic, formal), using colour and texture, inviting discerning judgement and analysis. Some of these gardens of grandeur were opened to the public. Some, such as that of Horace Walpole’s Strawberry Hill in Twickenham, became so popular that entrance tickets were issued. Henry Hoare, the owner of Stourhead in Wiltshire, built an hotel to accommodate his visitors. In the 19th century garden visiting became extremely popular with the growing middle classes. The advent of rail travel (and later the motor charabanc) enabled the urban working classes to join the foray. The ideal English home was a house with a garden. The Gardener’sMagazine, first published in 1826, suggested that looking at other people’s gardens was more beneficial than consulting a book for horticultural knowledge. People enjoyed the gardens in the many public parks established during the 19th and 20th centuries. Plumptre notes that by the turn of the 20th century, garden visiting combined ‘aesthetic pleasure; the appreciation of artistic quality and excellence in horticulture and garden design; education; recreation; recuperation; and curiosity’. Even those who did not own an extensive green space didn’t feel humbled by possessing a relative smallholding. What people saw while visiting was an inspiration for cultivating their own garden. Hence, the birth of the National Gardens Scheme (NGS). The owners of 349 properties with rather grand gardens agreed to open them to the public on one day during June 1927. The scheme was so successful that it was extended throughout the summer. Many impressive gardens joined the endeavour. Up until this time, most of the gardens featured were quite substantial rural or village gardens. 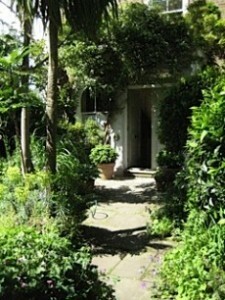 Horticultural excellence and an aesthetically pleasing appearance were common NGS gardens’ attributes, asserts Plumtre. But since the late 20th century not only has the number of openings risen from about 1250 to nearly 4000 gardens, but there has also been an increasing trend to involve a broader range of gardens. Gardens sometimes open in groups, in the same street or scattered throughout a village, usually in the afternoon, but also in the evening where one may enjoy a glass of wine, listen to a chamber music orchestra or a jazz band. They include allotments, ‘living walls’ and roof gardens. How, why and what people cultivate in communal gardens, schools, colleges, barges, houseboats, city farms, convents, a prison garden, and a Buddhist centre’s gardens are inspiring. The organic, environmentally sustainable and minimalist are popular. Visitors are drawn to enter the private sphere: they talk with owners and each other, discuss the pros and cons of allotments and share expertise and design tips. Garden owners perceive, manage and present their terrain in almost infinite ways, which may involve very personal considerations or more intellectual, schematic ideas. Inevitably and increasingly, Penny Snell, the chair of the NGS (soon to step down) tells me that increasingly more small gardens are likely to join the scheme. People don’t feel that their gardens have to be ‘rolling hills’ to join in. Jill and Martin Leman, both artists, open the front garden of their Islington 1830s terraced house for the scheme, as part of a group opening in the cobbled lane where they live. Jill’s work reminds one of Mary Fedden’s – her canvases reveal simple but well-defined domestic objects, the flora, fauna, birds and insects of a fertile landscape, with patterned or simple backgrounds. Teresa Farnham’s slate-paved garden in Wanstead, East London is minute (20 x 17ft). A sunken bath serves as a fishpond. Climbers, herbs, vegetables, shrubs and perennials amply fill the borders (the herbaceous border is itself a most English feature, invented by Gertrude Jekyll around 1900). When Teresa Farnham first opened her garden for the NGS, 100 people came to view. Far too many for such a small space, she says. So she devised the novelty of asking visitors (up to six) to pre-book tickets that include a four-course lunch. Now she serves pre-booked teas with sandwiches, scones, and cake for a maximum of ten. As a former NGS garden opener and one who continues to visit hundreds of NGS Gardens, I notice the increasing number of younger NGS visitors. Sue Whittington, who opens her steeply sloping site featuring extraordinary views of London’s skyline and an abundance of topiary shapes, agrees. Her neighbour, Bunty Schrager, who also opens her green paradise for the NGS, comments that garden and home ‘make-over’ television programmes encourage younger people to attend NGS openings. But, as Bunty notes, unfortunately they give the impression that gardening is an ‘instant thing… so sometimes people are disappointed when they learn that a plant they’d like to buy from our plant stall may not flower until two years’ time’. There is increased demand for allotments – ‘food additives and agriculture chemicals have encouraged people to grow their own uncontaminated produce,’ Sue comments, but, alas, some give them up because of time pressures. The number of schools who put ‘growing things’ on their curriculum impresses Bunty, who used to be a schoolteacher. Generally, as all of us agree, what fuels horticultural interest is a growing concern about our environment; how the way we live now may be destroying it. People want to connect with the world around them in order to help preserve its delicate balance. The tradition of the impressive public garden of the past continues today in gardens by such designers as Kim Wilkie and Charles Jencks but the NGS inspires vivid interest in smaller, more domestic gardens and in safeguarding our earthly paradise at a local level. The numerous joyous days out it provides are pure ‘splendour in the grass’. Christopher Lloyd (1921–2006) used to welcome visitors to the gardens of his family home, Great Dixter, Northiam, East Sussex. Sir Edward Lutyens and Lloyd’s father, Nathaniel, designed them. The gardens, now run by a charitable trust, still open for the NGS. Beth Chatto opens her gardens, near Colchester, Essex, for the NGS. She has created a splendid garden from what she calls a ‘wasteland’, which is essentially both very boggy and extremely dry. The NGS beneficiaries are: Macmillan Cancer Support, Marie Curie Cancer Care, Help the Hospices, Carers Trust, The Queen’s Nursing Institute, Perennial (The Gardeners’ Royal Benevolent Fund and The Royal Fund for Gardeners’ Children), plus ‘guest’ beneficiaries. In 2013, donations totalled just over £2million. For gardens open the public under the NGA, please refer to the annual publication of The Yellow Book, and also http://www.ngs.org.uk/gardens/find-a-garden.aspx. The photograph is of Jill and Martin Leman’s garden in Malvern Terrace, London N1, opened in aid of the NGS, © Jill Leman. This article first appeared in Cassone: The International Online Magazine of Art and Art Books in the May 2014 issue.